Stylish, contemporary and traditional charm is what you will find in this three bedroom townhome in popular Estancia Primera. 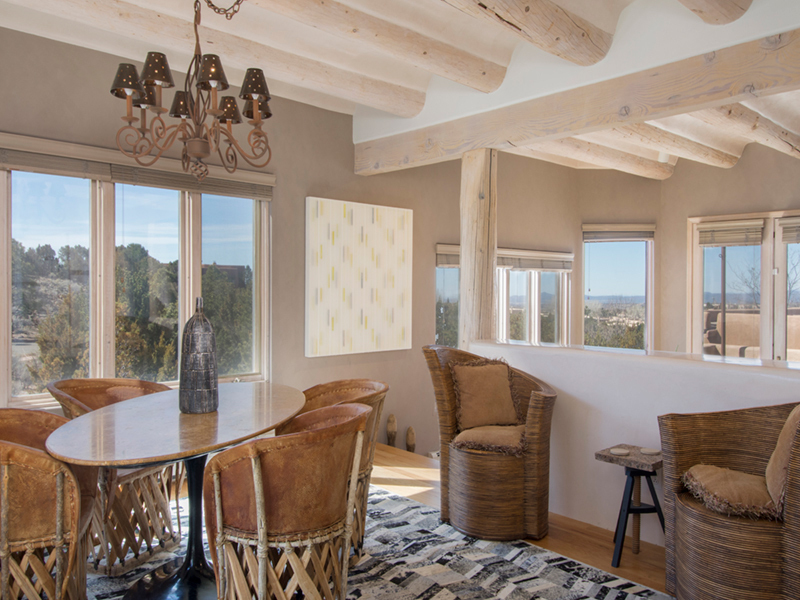 The corner lot offers a perched view overlooking the foothills and downtown Santa Fe. Lots of windows and French doors invite the outside in and warm the home with light in the living areas. There are high ceilings, coved vigas, hardwood floors and diamond plaster accents throughout the home. There is a beautiful deck with views for your outdoor dining off the main living area with access from the master suite as well. From the entry you go up a few steps to the living room and continue with a few steps to an open and bright dining and kitchen. 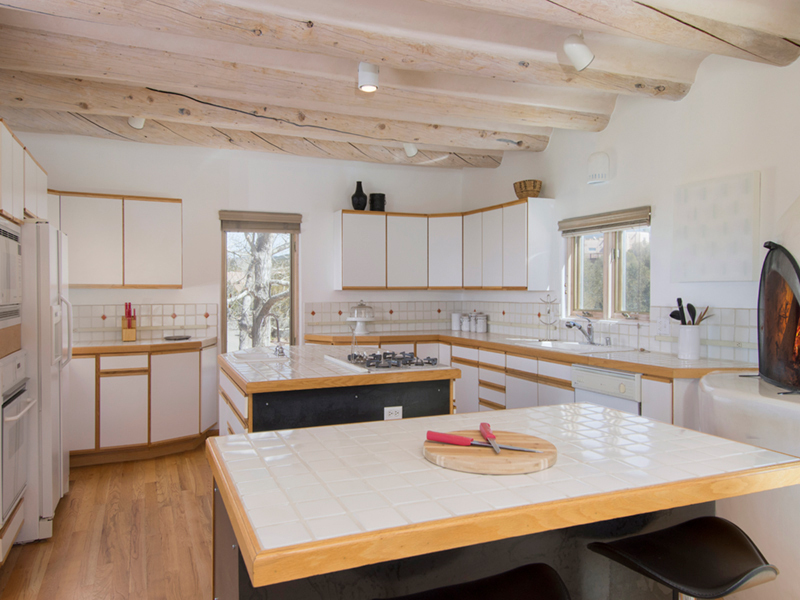 There is a classic kiva fireplace in the kitchen. 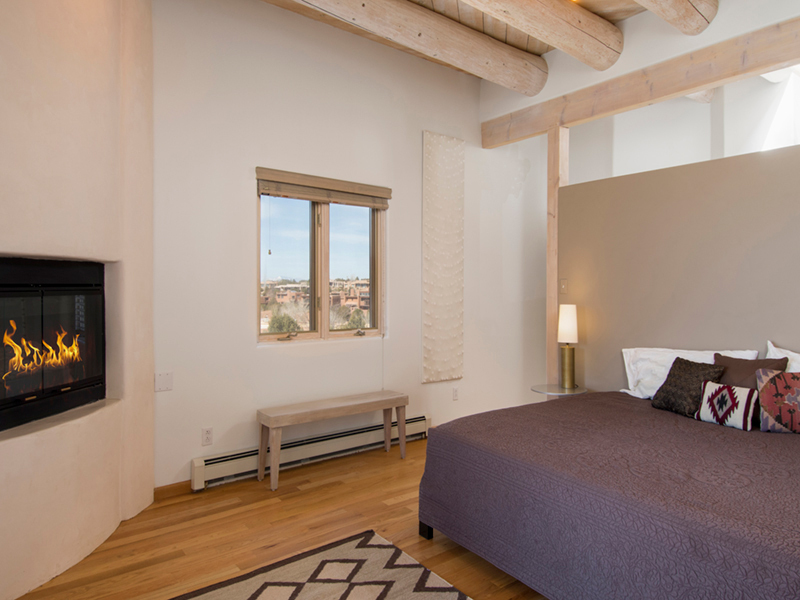 The master bedroom with king bed is located off the living room and offers a gas fireplace, wood floors and an ensuite bath with double sinks, two commodes as well as a deep tub and walk in shower. There is also a large walk-in closet. Downstairs you will find two additional bedrooms each with a queen bed and full bath in the hall to share. There is another covered, flagstone patio downstairs with chaises to relax and enjoy the quiet environment. The owner is a contemporary artist and you will find many of his original pieces of contemporary art throughout the property. This home is a pet-free, non-smoking property. Communal pool is available. Looking for pet friendly options? Please see our pet friendly properties! I spoke with both Marilyn and Elaine. Also a third person in the billing department. They were all very friendly and accommodating. Because of an unexpected surgery that came up for me, they graciously allowed me to reschedule a portion of my reservation to a later date. I was very grateful for this favor. My stay in the property was perfect. The beds are exceptionally comfortable. The only cautionary word I would say is to watch the driveway. It has a dip. The staff was friendly, efficient, and totally accommodating! I enjoyed every minute. I am going back to the same property in May. The mattresses were EXCELLENT! The property was light, with windows and views, and beautifully decorated and appointed! The kitchen was complete with every possible appliance and gadget, and there were linens galore. It was a beautiful home.